If you’re looking for a way to spoil your Mum (and yourself!) 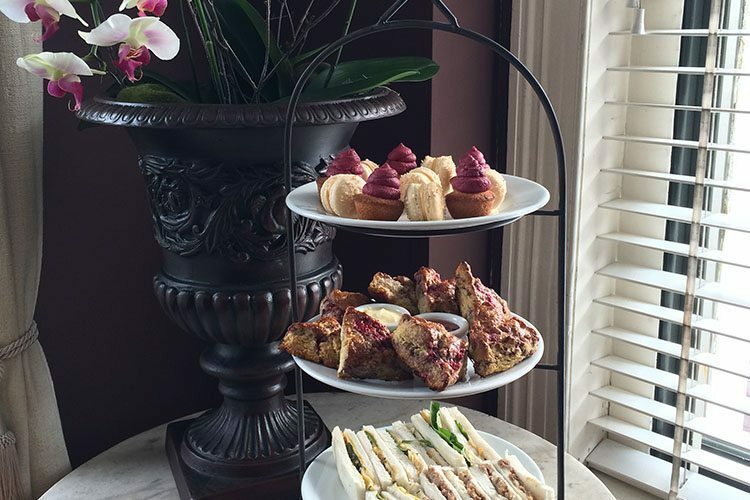 this Mother’s Day, a High Tea at Eichardt’s Private Hotel is a delicious and classy way to do it. A veritable tower of treats, every component is specially made from scratch by our chefs. Our blueberry buttermilk scones are full of organic Goodies From The Gorge blueberries and come still hot from the oven. Smothered in thick vanilla mascarpone and one of our homemade jams, they’re a crumbly fruity delight. Our lemon-scented mini cupcakes are frosted with blackberry butter icing; sweet and sharp at the same time. And our salted vanilla chocolate fudge is clearly a sin of some sort. The High Tea also comes with two hot savoury dishes – pork cheek croquettes in thyme breadcrumbs with apple & quince relish; and wild mushroom bruschetta, featuring field, bolete and portabello mushrooms, with feta cheese and sage crisps. You can give your Mum all this in the historic Eichardt’s Bar for just $49 per person, including tea or coffee and (most importantly) a glass of bubbles to wash it all down with. Obviously, you can’t send your Mum off by herself to eat and drink on her lonesome – that’s not what Mother’s Day is about! No, you’ll have to keep her company and help her work her way through all those sweet and savoury treats and swill back some bubbles with her. It’s tough, but when you think of all the sacrifices she’s made for you, you’ll know it’s the right thing to do. To make Mum’s weekend even sweeter we also have a very special accommodation package available to stay at Eichardt’s Private Hotel with all the usual deluxe inclusions of breakfast, evening cocktails, signature turndown – plus you will be welcomed by our exclusive Molton Brown amenities pack valued at $50 per person – his and hers selections available. Save 30% on the standard rate. Minimum two night stay.